For liquids heavier than water Tolerance ±1 scale division Requires a cylinder 300 x 38 mm and 300 mL of liquid. …from steel pellets free from lead and mercury. 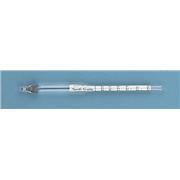 Specific Gravity – With over half of the Kimble Chase hydrometer products falling into this category, this is the most common hydrometer classification. 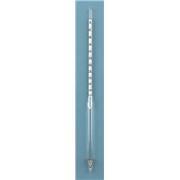 Specific gravity hydrometers are available in a variety of graduation ranges and overall lengths. …pellets free from lead and mercury. 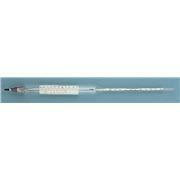 Specific Gravity – With over half of the Kimble Chase hydrometer products falling into this category, this is the most common hydrometer classification. 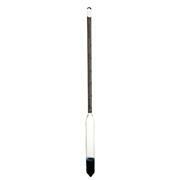 Specific gravity hydrometers are available in a variety of graduation ranges and overall lengths. …length of graduated scale 140 mm Tolerance ±1 scale division Requires a cylinder 340 x 38 mm and approximately 260 mL of liquid. Models 6026Q20 and Q30 hydrometers have specific gravity scale in divisions of .002, Baume scale in 0.2°; 6026Q35 in 0.005 and 0.5°, 6026Q40 is scaled in 0.01 and 0.5°. For testing small quantities of liquids heavier than water Approximate total length 150 mm, approximate length of graduated scale 45 mm; interval 0.005 Tolerance ±2 scale divisions Requires a cylinder 150 mm deep x 25 mm i.d. and approximately 50 mL of liquid.